This is how the town had welcomed us. It had this timeless holy vibes affixed to it and there was something infectiously likeable about the place the moment we had stepped afoot on its sacred soil. The divine chant mixed with the tempo of ringing temple bells flooding our ears every other moment had instantly taken away all the weariness of a two day train travel bestowing upon us a fresh lease of energy and roving us to a state of holy bliss! This was Uttar Pradesh, a northern state in India, where a small town infused with such level of divinity and piety does exist in reality – Mathura! A mythic town of the olden days, Mathura is the birthplace of the most lovable, the darling of all Gods, the blue hued God of the Hindu Pantheon - Lord Krishna and aptly forms the heart of Braj Bhoomi (Brajbhoomi can be divided into two distinct units - the eastern part in the trans-Yamuna tract with places like Gokul, Mahavan, Baldeo, Mat and Bajna and the western side of the Yamuna covering the Mathura region that encompasses Vrindavan, Govardhan, Kusum Sarovar, Barsana and Nandgaon). A city steeped in historical tales, myths and legends dating many centuries back, it still retains relics of the same with its numerous historic temples and shrines very well holding guard its mysticism for any spiritual seeker setting foot on its holy soil. Mesmerizing tales from this holy land find mention in many an ancient Hindu Scriptures like Mahabharata, Ramayana and the Bhagavat Purana and they all miraculously come alive in the narrow corridors of Mathura. Historical buildings stand in every nook and corner providing a rare glimpse into the past, their antiquity never failing to overwhelm you. Along with all the chaotic hustle bustle of the town, there is the serenely flowing Sacred Mother River Yamuna who has Her own charm and personifies the pious fervor of the city and its people to a great extent. It’s a wealthy city - rich from the enthralling tales of a much-loved deity, rich from the age old cultures and traditions that it has long held on to, rich from all the antiquity of a distant past, rich from all the warmth and humility of its people and it willingly lets out all of it for You; the thirsty soul on a pilgrim trail. You can hang around near the Yamuna River, pray quietly in its temples or watch sadhus and sages in orange stroll down the ancient alleys just as Krishna did many ages ago. Buzz, history, chaos, peace… it’s all here and anything you do or anywhere you go there is always something infectiously likeable of the place. Every day is a festival here devoted to someone much adored and revered at the same time. Mornings start with people walking down to the Yamuna Ghats and taking part in the various rites and rituals. This is then followed by a visit to the many temples to pay reverence to their beloved God. Festivities peak during special days like Janmashtami, Holi and Diwali when the entire town gets draped with lively acts and performances depicting scenes from Lord Krishna’s life attracting pilgrims, historians and tourists alike to this intriguing city by the dozen. Home to Lord Krishna and His many legends, Mathura today is a warm swirl merging history, festivals and chaotic fanfare; its currents drawing travelers from far and wide taking them deep in our ancient culture and heritage! 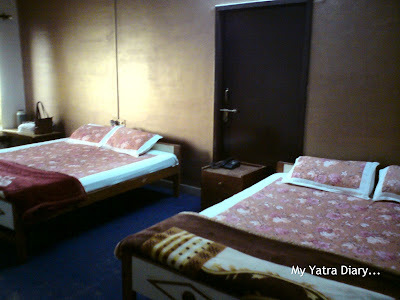 Mathura, being a popular pilgrim destination has a lot of options when it comes to stay, catering to all types of budgets and pockets. However, beware of getting entangled in the rickshaw touts promising to get you to a good accommodation. It’s advisable that you do a search on the net and book one for yourself well in advance, especially if you are planning a visit in the peak months (Oct-Mar) or during the festival times. It’s always better to be well prepared even before stepping in the city rather than keep things for the last minute. Situated off the main roads, the hotel is recommended for a peaceful stay in this rather chaotic city. The rooms are good and the bathrooms are fairly clean too. 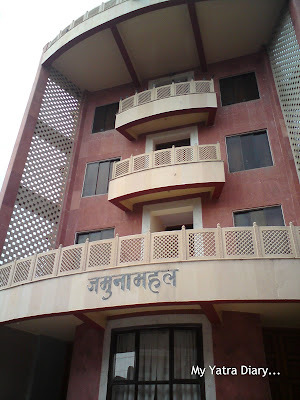 Jamuna Mahal Hotel, Our place of stay. Shree Yamuna Palace - Situated in the bustling bylane of Mathura, this one is a budget hotel and can be considered as an option for stay too. 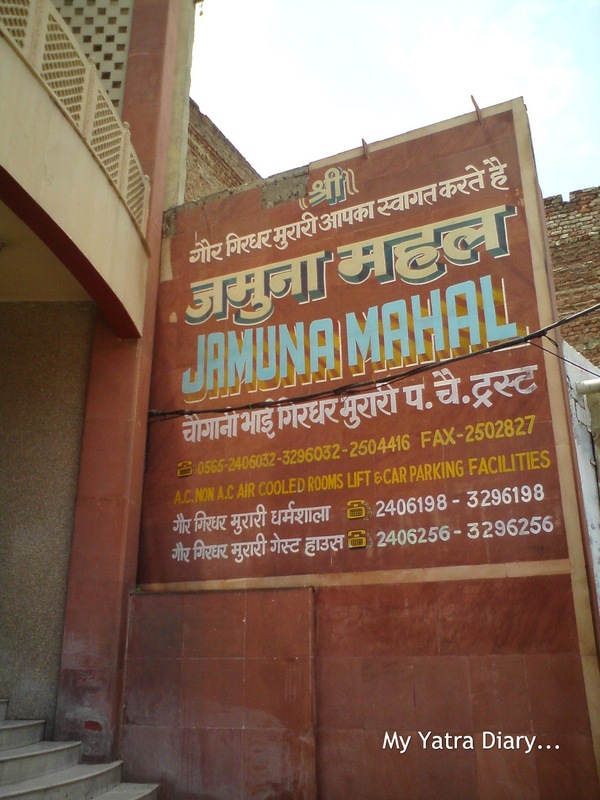 Mathura is well connected by rail and road with major important cities in India. Railway Station: There are 4 railway stations in the city, the most prominent one among them being, the Mathura Junction connecting it to the rest of India. From Mumbai, the best way to reach the city is via the train. A convenient option would be the Rajdhani train that leaves Mumbai at 6.30 PM in the evenings and reaches Mathura at 9 AM the next day so that you have an entire day to explore the town. Air: Mathura does not have an airport to call its own but one can still take a flight till the nearest city airport that’s Agra. From here on, hire a car or an auto to get to your final destination. The best way to explore Mathura would either be on foot or a cycle rickshaw which besides being cheap also lets you soak in the feel of the town at a leisurely pace. 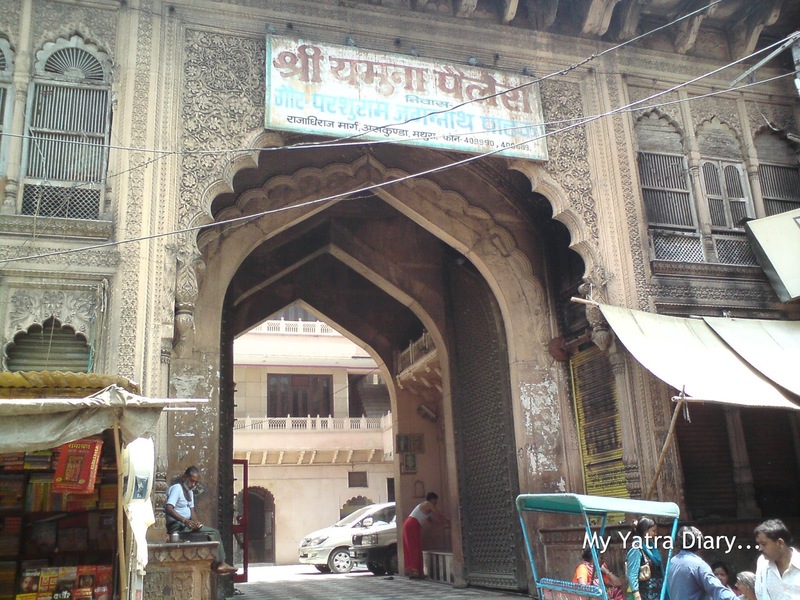 One major landmark of the town is Holi gate that acts as a gateway to the old part of the city housing the Vishram Ghat, the Yamuna River and the Dwarkadheesh temple. Apart from the cycle rickshaw, one also has the option of auto rickshaws which are not metered. These should be used only for longer distances and are best dumped for cycle rickshaws while traveling within the city. @Arti Good evening.Just read your beautiful post on Mathura,Great to read it.Thanks a lot for the information & Photographs. So much info, that's brilliant and tells a lot about the place! I did a golden triangle trip from Jaipur to Madura and Agra. Loved Madhura. It just gave me goosebumps to see the place where Krishna was said to have born. There's this small museum of Avathars which do small and simple mechanical movements stuff just next to the temple. That's amazing too. Although I stayed just for 1 day I loved the place! Nice ! I also wish to visit Mathura. Information about how to reach and accommodation is very useful. What a wonderful tour you've taken us on, Arti, as always! Mathura looks like a great place to visit and your photos are the next best thing to being there! Thanks for sharing the fun! Hope you have a lovely weekend! Enjoy! This looks like the most wealthy place you have posted, the hotel room is clean and pretty, too. The architecture seems like a mix of old elaborate and new. Excellent piece of info.. Will keep this post as a reference for my visit to Mathura.. I would opt for the quiet hotel as an oasis, so that I'd be rested for all the wonderful activity taking place during the days. I would love to go there; thank you for sharing. Good information for the traveler! Very informative post as Mathura is on my wish list .Thanks for sharing. Very informative post. Interesting titbits on the place and useful information regarding accommodation. It's hard to know such info in Japan. Strange how we sometimes just have to step foot in a certain place and we get an instant vibe. Great post as always, a perfect mix of interesting and informative. I've been to Mathura it is so nice! We tried to imagine how it would have been in Krishna's time! Our Yatra was filled with laughter and singing! Mathura looks like a beautiful place to visit. Thank you for sharing,Arti. the post aggravated my desire to visit the pious city. Beautiful post on Mathura. Unfortunately we located ourselves at Delhi and then covered all those places. I see Mathura is a wealthy city. It must heal me if I visit there. Thank you for sharing the great city. The divine chant and the ringing bells, that’s a nice and fascinating way to be welcomed. It’s like walking through history as I always feel on your blog. In the first photo, there are two girls wearing school uniforms like Japanese students, which is interesting. Yesterday my commenting to this post was unsuccessful. I’ll make it another try. Sounds like a grea place to visit Arti! Hope your weekend is lovely! Interesting that they still use rickshaws there. And those signs! I would never be able to read them. I enjoyed my tour, it is like being there for real. You put so much into your posts, they are wonderful. Thanks a lot for the information &photographs. I watched a beautiful movie last night that was filmed in India - The Waiting City. It was a sensual smorgasbord of sights, sounds, smells. I loved the colors, the trains, the people, everything about it. I was reminded of you and this morning discover your comment left. Your photos similarly capture the sights and sounds of this rich city of Mathura. (I wouldn't know if it was fairly depicted, but I was mesmerized nonetheless). thank you for another informative post, an invitation to visit this mystical, historic place. What a treasure. happy day to you Arti. take good care now. Had been to this place long back when we visited Agra. 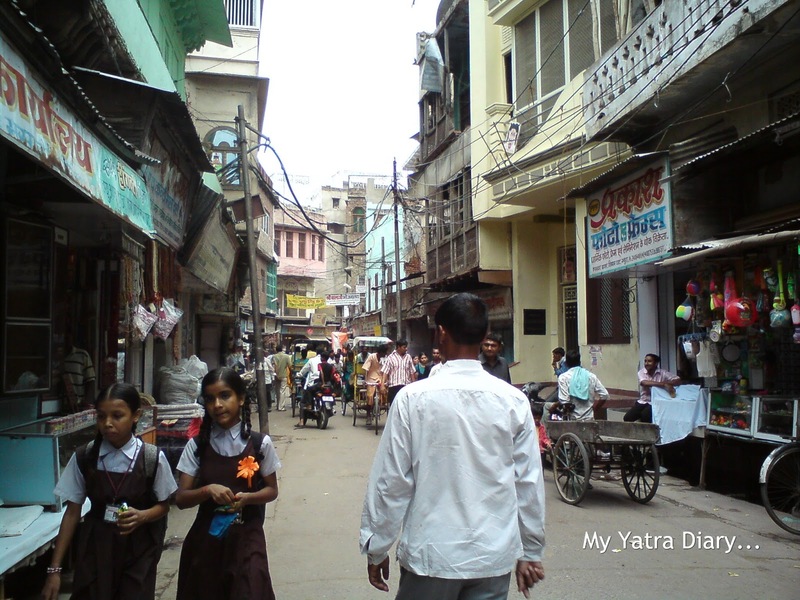 Thank you for sharing the wonderful post of Mathura, looks like a wonderful place. Great information for people visiting your Country. I like the street scenes that you post, Arti, showing the hustle and bustle of these ancient holy places. It really does sound delightful! nice iformation ,, if any body visit there, he can hav your blog view.. I have a long pending desire to visit Mathure..specially now when my ma has taken deeksha from a guru there. Lovely. Will try to visit next time I'm in the area. I learned a lot just by reading this post. Thanks for coming up with the most informative...and entertaining details re your trips, my dear friend. wants to visit Mathura first time. Hey Arti, Your pictures really bring the place come alive. I would love to stay in that hotel! Beautiful post! Had gone to Mathura many years ago as a kid. After reading your post, feel like going again. Hi. nice post. i am planing to go mathura in January 2013. I am a Fine artist. I love photography. For my photography i need your help that; i want to know which places i can go in mathura. Also How many days i have to stay in mathura. Pls suggest. There is so much to see in and around Mathura. Vrindavan is also nearby as is Gokul and Barsana. I think if you want to visit every place at leisure then 7-8 days is a must. There are numerous Temples in the region all related to Lord Krishna. You can take the boat ride in Mathura. Just walking the streets will give you ample opportunity for photography!! Nice post on different essence of Mathura. Visitors need to know the Mathura temple timings to visit the temple hassle free and enjoy the essence of Mathura .